A baby Tarpan horse has been born in Bulgaria's Rhodope Mountains, the first one to come into being in 2013. The newborn wild horse is likely to be named Katya. Representatives of the New Thracian Gold project have told local media that more baby Tarpan horses are expected to be born over the coming weeks. 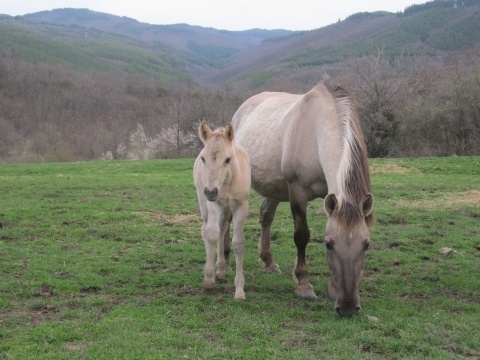 A total of four Tapran horses were born in Rhodope region in 2012. Tarpan horses, a breed that disappeared from the wild in Europe two centuries ago, were reintroduced in Southeast Bulgaria back in September 2011. The Tarpan is a prehistoric wild horse type that ranged from Southern France and Spain east to central Russia. Paleontologists have found out that the species was present in Bulgaria, too. It died out in the wild between 1875 and 1890 Beginning in the 1930s, several attempts have been made to re-create the tarpan through selective breeding. Their role in Eastern Rhodopean is the same as in ancient times: to graze the wild vegetation, to mould the wilderness and to support a natural ecosystem. Wild Tarpans have a reputation of being tough and easily adapted to the harsh conditions of semi-open wilderness landscapes. » Why Horses Die of Cold and Hunger in the Mountains?